rates were observed for both a-2,6-sialyltransferases over the porcine a-2,3-sialyl-transferase, although all the rates are high enough to be synthetically useful. This study has shown that numerous C5-modified CMP-NeuAc sialyl donors can be successfully utilized in the synthesis of modified glycoproteins. The sialyltransferases investigated were found to accept many variations at C5 and C9 of the sialic acid moiety. Halcomb and Chappell confirmed this fact with studies of sialyltransferases from different sources . The C9- and C5-modified substrates in Scheme 37 were good substrates. However no activity was detected when compounds 111 and 117 were assayed. In addition to these examples, other CMP-NeuAc analogs that have been prepared and successfully transferred include C9 fluorescent compounds, C9 thioacetyl, C5 thioacetyl, and C4 dexoy . A particularly useful modification introduced by the Wong lab incorporates a mercury atom at C9 (Scheme 38) . Transfer of this sialic acid to glycoproteins could greatly aid in X-ray crystallographic analysis of these biomolecules. The field of solid phase synthesis has also benefited from enzyme technology. Several reports have described the use of sialyltransferases in the solid-supported synthesis of oligosaccharides that bear sialic acid . Additionally, metabolic pathways have been harnessed by Bertozzi and coworkers to synthesize glycoconjugates on cell surfaces that bear modified sialic acids . 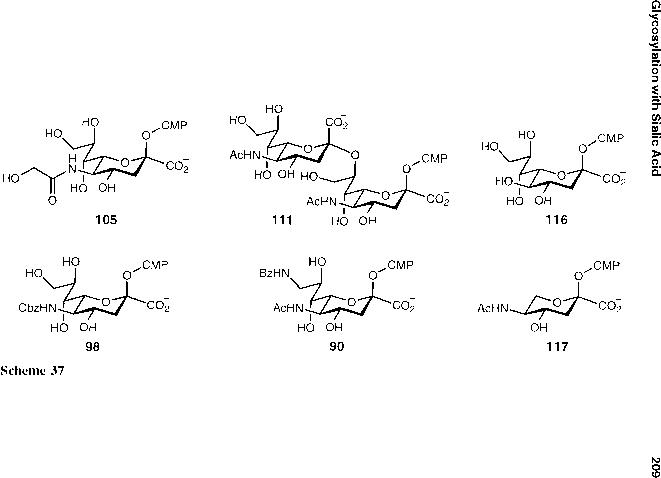 Enzymatic methods are efficient for the assembly of complex oligosaccharides on a small scale, although the high cost of sugar nucleotides and problems with product inhibition detract from this approach in large-scale reactions. The synthesis of CMP-NeuAc by CMP-NeuAc synthetase requires stoichiometric amounts of expensive reagents, such as CTP, while the CMP by-product of the sialyltransferase reaction is an enzyme inhibitor. Ichikawa and Wong used the concept of in situ cofactor regeneration to alleviate these problems and increase the efficiency of sialylation (Scheme 39) . The cascade begins with stoichiometric amounts of phosphoenolpyruvate (PEP), ^-allyl-V-acetyl lactosamine 120, NeuAc 1, and catalytic quantities of ATP and CMP. 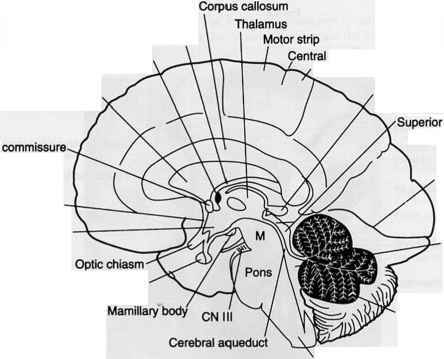 Initially, CMP is converted to CDP by nucleoside monophosphate kinase (NMK) in the presence of ATP. The CDP produced reacts with PEP under pyruvate kinase (PK) catalysis to form CTP. Next, CMP-NeuAc synthetase catalyzes the in situ formation of the sialyl donor from NeuAc and CTP. The pyrophosphate byproduct is decomposed to inorganic phosphate by inorganic pyrophosphatase (PPase). Subsequently, the a-2,6-sialyltransferase accomplishes the sialyation of the lactosamine acceptor 120 and produces the transferase inhibitor CMP as a by-product. The CMP concentrations are kept low by conversion to CDP, and in so doing the problem of product inhibition is minimized. The cycle afforded 21% of the sialylated trisac-charide 121, which is remarkable considering the complexity of the system and number of synthetic steps that can be avoided.